Murray Equipment Inc. designed the original system and building layout for the new liquid fertilizer and chemical facility at Nutrien Ag Solutions’ Urbana, OH, facility. Nutrien Ag Solutions’ new retail facility in Urbana, OH, needed to do more than meet basic grower needs. It needed to deliver next-level customer service, maintain inventory accuracy, and achieve high-speed in-and-out access, all while keeping environmental responsibility at the forefront. To secure the latest in technology and facility design, Nutrien Ag Solutions reached out to Murray Equipment Inc. (MEI), the leader in liquid handling equipment and automation. Murray Equipment supplied the initial building and layout design and worked with Nutrien Ag Solutions to adapt the plan to meet all of its requirements. 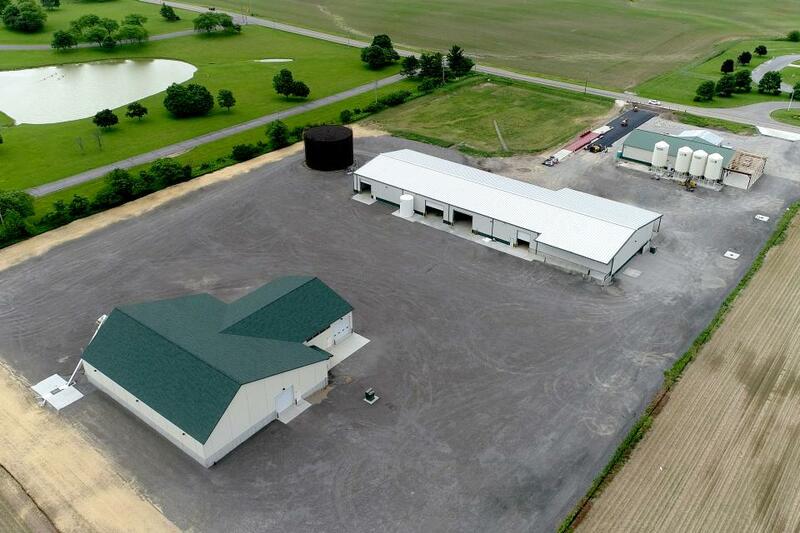 The Nutrien Ag Solutions facility includes a 300,000-gallon UAN tank, four 12,000-gallon nutritional tanks, 10 5,000-gallon bulk chemical tanks, two load-out bays with four load-out points as well as a 24/7 unattended fertilizer load-out bay. Murray Equipment supplied the equipment, skid units, tanks, controls, and even the electrical components to create a turn-key solution. Nutrien Ag Solutions took advantage of the latest load-out control technology. This facility was built around MEI’s ICS 240 Load-out Control as well as the ICS 24-7-32 Unattended Load-out. The ICS 240 controls the two load-out bays and mini-bulk filling station. At this facility the system measures based off both scale and meter, ensuring accurate and precise blends, including those with hand-adds. The ICS 240 and system layout allows automated batches to be blended and loaded pre-mixed into customer tanks. Or the batch materials can be separated into different tanks on the tender truck and loaded into the applicator onsite. This option keeps the large carrier tank clean, preventing contamination and increasing through-put. The ICS 24-7-32 Unattended Load-out is designed to allow growers with a preset load number to load UAN on their time schedule, around the clock. “We believe the grower of 2030 will want to pull product when they see fit; not being tied down by our hours and schedule,” Emery says. In addition to the technology, Nutrien Ag Solutions and Murray Equipment also took a unique approach to the facility design. High-volume and low-volume skids were plumbed so that the same bulk fertilizer tanks could be used to fill large tender trucks and applicators as well as smaller mini-bulk tanks. This lowers the amount of mini-bulk storage tanks required, not only increasing product margins but also improving environmental friendliness. The project is scheduled to be completed in the next month. Nutrien Ag Solutions has been pleased with the entire process from start to finish.